What's Joe Flacco's Record Deal Really Worth? Let's put this simply: Joe Flacco's six-year, $121-million contract is actually for three years and $62 million. One day the grand totals of NFL deals will stop being reported, since the later years are more or less imaginary. (Remember, NFL contracts aren't "contracts" in the most common sense.) Flacco's massive deal with the Ravens looks enormous, and ostensibly makes him the highest paid player in football. But it's as much of a fantasy as any long-term deal worked out in the salary cap era. Pro Football Talk points out that year four comes with a cap hit of $29 million, meaning there's about zero chance the Ravens enter that season with Flacco still on this current deal. They'll re-negotiate, just like how seemingly every other quarterback is currently restructuring for more cap flexibility. In the meantime, it'll be a pretty lucrative three years for Flacco. He gets an immediate $29 million signing bonus, and unless he suffers a catastrophic injury, all $62 million will be paid out, largely in the cap-friendly form of option bonuses. 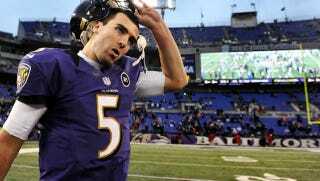 Joe Flacco is Baltimore's quarterback of the future—or at least until 2016.